Do you know the difference between direct heat and indirect heat? If you want to step up your grilling game you should. For all practical purposes it comes down to a question of temperature and time. Direct heat grilling involves having your meat put over the flame with the lid open. This works for thin cuts of meat like fillets and kabobs that you want to cook fast. Indirect heat is better for larger pieces of meat like steak or roasts. For this the food is cooked off of the flame with the lid closed. In other words set only half of your flames going and put your meat on the side without the flame. It will take longer to cook but will definitely cook all the way through. A few other things to keep in mind is that you should make sure all your ingredients like rubs or sauces or marinades are made before you put your meat on the grill. You also want to make sure that your raw meat is kept separate from your cooked meat. That goes for serving platters and cutting boards. As you cook on your grill you should keep an eye on temperature. All cuts of meat need different temps to cook. A meat thermometer is best but an outside thermometer attached to the grill will do the trick. Of course, all of these enhance grilling techniques can only work if you’ve got the right grill. If not, it’s time to make the switch and Junk King Raleigh can help. Wait! Junk King is going to help you grill? Actually, no but they will be the perfect team to get rid of that old grill, sometimes which can be hefty and dangerous to carry. The last thing you want is to have a rust bucket sitting next to a shiny new model. 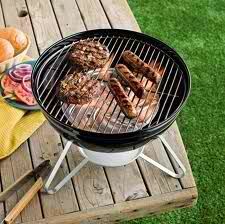 A grill is one of those things that can’t be thrown out or simply be put on the curb. With Junk King that grill can be taken away quicker than it would take to cook up some burgers. While they’re at it the Junk King crew can also take away anything else you want to finally get rid of. Now is the chance to clear all the junk from your backyard like the rickety patio furniture that nobody wants to sit on or kids’ play sets that they’ve outgrown. All of those junky things can be tossed onto the back of the Junk King truck by the capable crew. You can also get rid of any clutter from your garage, basement or attic. Make sure you’re not throwing away any treasures. As for the rest of it, give to Junk King Raleigh. They’ll know where to take it! This entry was posted in Junk King Raleigh, Raleigh Appliance Disposal, Raleigh Junk Recycling, Raleigh Junk Removal and tagged Raleigh Appliance Disposal, Raleigh Grill Disposal on April 30, 2013 by Britt Holcomb. Last updated August 1, 2017 .